This is the back of a vest that I'm working on. You can't see the piping that separates the yoke from the bodice, but it's pretty terrific. Flush with success I decided to bind the armholes before tackling the collar. And of course I did this without reading the directions first. There's an adjustment that needs to be made to the front armholes before binding. Ay yiy yiy... So now the vest is sitting by the wallet which didn't turn out, again because I don't read directions. This forced stopping point seem to be a perfect time to work on a couple of simple things that I'm working on. Friend Carol wanted pretty fabric to use at the altar for her reading, and these three fabric pieces just needed a simple hem. Favored physical therapist Chandra needed a minor adjustment to a beautiful vest of hers, and sister Paula bought a lovely scarf when we were in Kenya. She decided it was too wide to wear comfortably and said if I cut it in half lengthwise and hemmed it, I could keep half. So now I have a great giraffe scarf! And my good trusty Husqvarna Sapphire 830 is back in the shop. Frustrating, but at least I do have other machines. I'm starting to haunt eBay, with John's blessing, to look for another machine to add to the stable. Just looking so far. A Round Robin is a quilting exchange where quilters add a round to another quilter's piece. 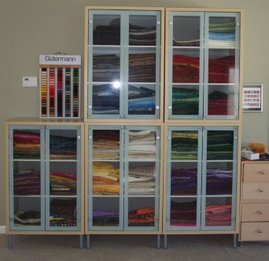 Here is the current Chicago Modern Quilt Guild Round Robin, organized by our lovely Sue. We started with 8" blocks that featured applique. This is Rachel's original block, a lovely rainbow cupcake. The theme of Round Two was rectangles. Holly took Rachel's cupcake and added this perfect border fabric, but only after she added whipped cream and sprinkles to Rachel's cupcake. This was how the block looked with I got it. The theme of Round Three was diamonds, and this is what I did to Rachel's cupcake. Diamonds are tricky, and I'm relying on the colors of these diamonds to complement and not overwhelm the cupcake. 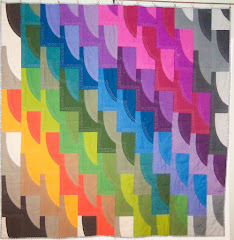 I like playing with my Chicago Modern Quilt Guild friends! The best fabrics, directions, and efforts don't always equal success. I've been working on a trifold wallet. I love the fabrics. I've tried to follow directions. And something just isn't working. Do you see my friend Mr. Seam Ripper? He and I and this wallet will spend some quality time and see if we can figure out what I did wrong and whether this wallet can be salvaged. So back to purses - both envelope and hobo styles. I've begun work on this Abbie's Hobo bag by quilting the band and the strap. Love that batik! This is my 6th year of retirement. I love this time of year. 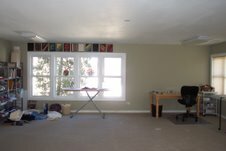 And I love that I'm able to spend as much time in my studio as I do. The envelope bags are one I started several months ago. I'm experimenting with a zipper to close the main part of the purse, and I have learned that iron-on velcro really needs to be sewed as well as ironed. This week? Perhaps a couple of Abbie's Hobos. And I'm also working on a wallet pattern by byannie.com. This spring John and I toured several national parks of the West. One of the women on our tour loved the quilted jacket I was wearing. Before the trip was over she ordered one of these jackets in Grand Canyon colors and paid for it in cash. Doris is a Democrat regarding Wisconsin and national politics, so of course I have her the Liberal Discount. She and her daughter are traveling in October, and she wanted her jacket by then. Here it is - all ready to go in the mail and then be broken in. Breaking in a jacket? Absolutely, especially a quilted jacket. 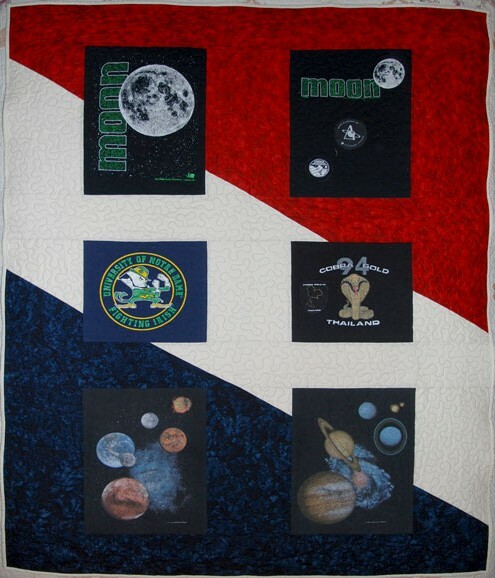 Despite using the thinnest batting (Thermore), there are essentially five mini quilts (2 sleeves, 2 front, and a back) that have been sewn together. This jacket needs to be washed and handled and worn. So, Doris? Get busy! And stay politically active! Marc is a young man my husband knows from the Brookfield Jazz Society. He's a graphic artist/designer with a website. For a few years he's been talking about doing a quilt from some of his t-shirts, and we finally got around to it. His birthday is the 4th of July, so 6 of his shirts are on a red/white/blue background. 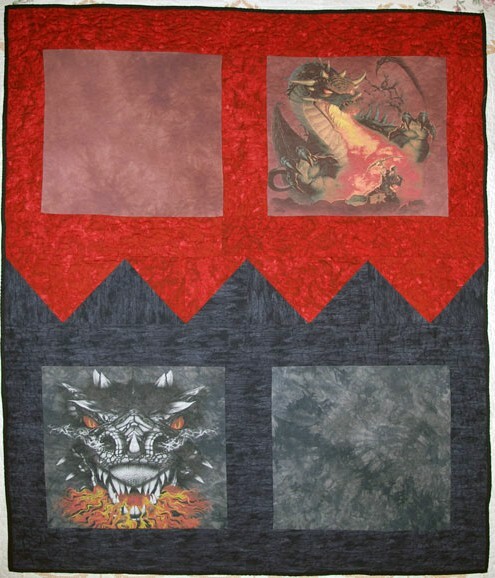 This second quilt incorporates two beautiful shirts against a red/dark grey background. There was an additional t-shirt that I thought was lovely, and this has become a wall hanging. Nice way to save and honor these shirts that are so special to Marc! That Annie Unrein is a very clever woman - she's the brains behind byannie.com. Earlier this week I finished making her Serentiy purse. The kit was amazingly perfect and generous with the fabrics. So generous that I've been able to make a second product from the leftovers. This is byannie's MiPad case. I did have some extra Texture Magic, so the front of this case has a lovely inset panel. The back uses the same fabric but without the Texture Magic. This pattern was a challenge, which is one of the reasons I wanted to do it. There's a zipper at the top of the bag, and there is also an adjustable strap, two techniques I've been wanting to learn. 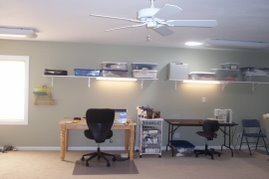 What made this iPad carrier project possible for me to do is the series of YouTube tutorials found on Annie's website. Each step of the way was so nicely demonstrated. It was almost better than taking a class! And whatever Annie says? Do it - she's right. I used one of the heav-duty purse zippers for the side pocket and didn't have another one in that color. So I used a regular zipper for the top of the bag. It works - it is just not nearly as nice. Having enough fabric leftover from Serenity was a bonus. I love this carrier, and it's incredibly sturdy - absolutely perfect for travel. Can't wait to try this out!